Fans favorite creator Josh Howard begins an all-new saga and sequel to the popular DEAD@17 series with BLASPHEMY THRONE #1, the first issue in the seventh and final installment in the DEAD@17 story—and an epic finale that will take readers’ breaths away. DEAD@17 follows the story of Nara Kilday, her subsequent death and resurrection, and her ongoing struggle with the forces of darkness. Nara's quest to discover her true nature and realize her destiny has put her in conflict with sinister cults, demon lords, a vampiric succubus, and even her closest friends. At the conclusion of the previous series, DEAD@17: THE WITCH QUEEN, Nara found her spirit torn from her body as she attempted to escape Purgatory. Now, held captive by unknown entities in another dimension, Nara must find a way to return to Earth, reunite her spirit with her dying body, and put an end to the reign of Abraham Pitch and The Beast. "I couldn't be more excited to finally be telling the conclusion to Dead@17 and to be doing it at Image. It's been a great ride, and I couldn't have done it without the support of the series' loyal and dedicated fans,” said Howard. “Having spent a third of my life with these characters, it's going to be hard to let them go, but I can't wait for everyone to learn the ultimate fate of Nara and her allies." 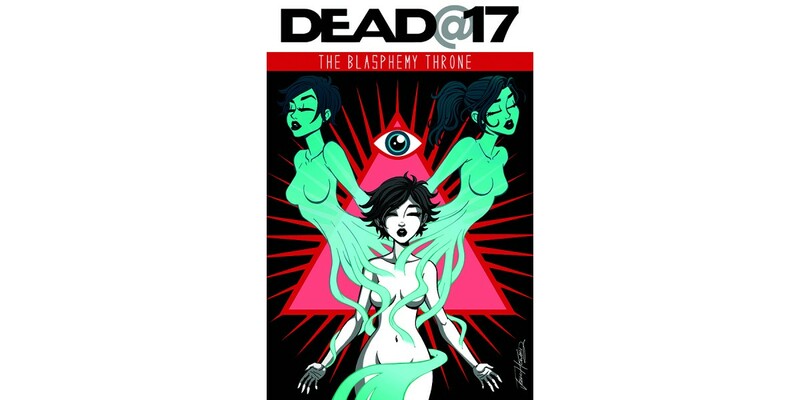 DEAD@17: BLASPHEMY THRONE #1 arrives in stores on 8/13 for $3.50. It is available to pre-order with Diamond Code JUN140473.